Yes. I was thinking about them especially this week because my dad use to make them for me for my birthday. Originally he made them every Christmas (it was his own family’s recipe), but the past several years things were so busy at Christmas — and I was the only one who kept insisting on them — that he started making them for my February 1st birthday. He’s been gone for two birthdays now, and that’s part of what led to my thinking about the cookies. The food looks good also. I might not have if I lived in your timezone. Although, I’ve noticed when I put something up at a particular hour here, it shows as being posted an hour later in time a lot of times, so I’m not sure what that’s all about. Do you have your time zone set in your settings? On all you blogs. Maybe you missed one. I’ll double-check that. I hardly ever do anything on the “Happy Patriot” and Christmas sites, but I do hate to just delete them. There’s stuff on there that people can still read and get some good from. And I do add a couple items to the Christmas site each year. I like to visit it myself when I need a little Christmas throughout the year. By the way, the cookies look great. They are — made with delicate pastry and hazelnut packed filling (or pecan if hazelnuts aren’t available.) I just wish someone in the family still made them. never had them but certainly look good and willing to try….. 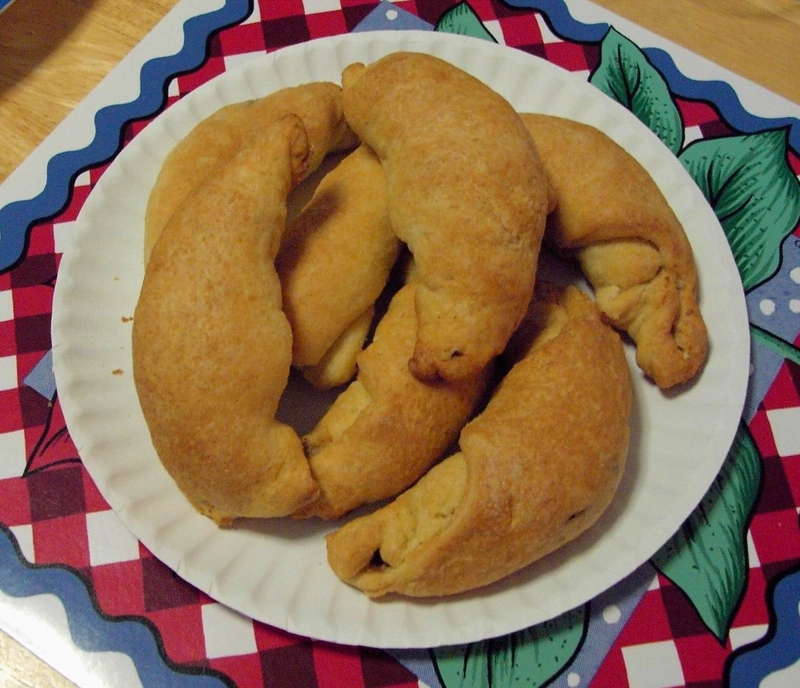 They are actually from an old family recipe on my dad’s side — although they were not Hungarian. My dad and his sisters were the only ones who made them, and, frankly, his sisters started putting less nut filling in theirs, so my dad’s were the only ones we all liked. He’s been gone two years now, and no one in the family makes them anymore. I’ve never tried to do it, but I may have to if I want any. The recipe calls for a filling made from hazelnuts. It’s very rich, and sometimes, when hazelnuts were hard to find, Dad made them with pecans. Either way, they were delicious. I love both hazelnut and pecan, it is a shame when family things like this either get lost or just left to history.. my mother was a good cook, she work for private houses and I am sure she took some secrets with her.. sad! They look like mini croissants, bet they’re delicious! Yes they are!!!! — or were. No one bakes them now.